Author/Illustrator Matthew Holm: Announcing the SQUISH tour 2011!! Announcing the SQUISH tour 2011!! This is actually the WORLD PREMIERE of SQUISH! 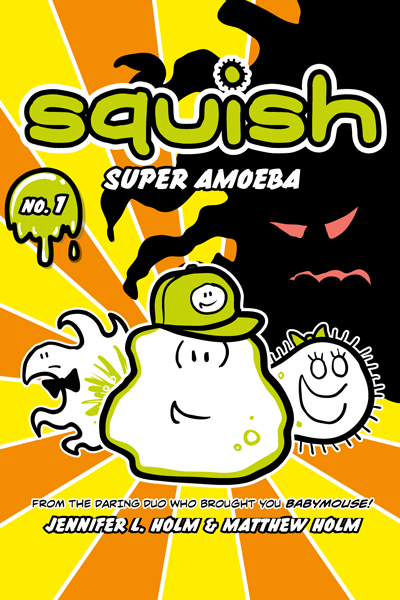 It's Free Comic Book Day, which is always a good reason to go to a comics shop (should you need one), but it's also your chance to get a copy of SQUISH: SUPER AMOEBA three whole days before anyone else in the world! I'll be there to sign books (SQUISH or BABYMOUSE) and will even have some special prize giveaways! Be there! Jenni and I will be visiting—and speaking at—the International Reading Association's annual convention. Hellloooooo, educators! More dates (particularly in Seattle, WA) still to come! Stay tuned! SQUISH Interview at Graphic Novel Reporter!